Lambs boss Gary Mills has moved swiftly to bring in two new players ahead of the game Blue Square North league fixture with Barrow on Saturday. Kick off is 3pm at The Lamb. Tamworth Football Club have this afternoon agreed to release Gerry Taggart from his contracted role as player coach. Following an agreement between Tamworth and Leicester City, which will include a first team friendly for the beging of season 2008/09. We would like to thank Gerry for his service during his short stay, and wish him well for the future. Manager Mills has signed a midfielder and a defender in an attempt to get back on the winning track when Barrow visit The Lamb for the first time. Anthony Robinson is due back from suspension, Jose Veiga could well feature between the posts after his international call up and it is hoped Adie Smith will return to the side after injury. On the transfer front, 26 year old Craig McAughtrie has signed from Stafford Rangers for an undisclosed fee and it is expected the 6 ft 4 inch defender will go straight into the squad. He has been almost an ever present in the starting elevn making over 200 appearances for the Blue Square Premier strugglers over the last five or so seasons. The other signing is that of midfielder Chris Nurse. He has signed from Hinckley United originally hailing from London but currently studying at Birmingham University. He played for Kingstonian and Sutton United before moving to Aldershot Town in 2005 and transferred to Moor Green in November 2005 as he started his University course before signing for the Knitters. Moving the other way (to Hinckley) is Kyle Storer, who leaves the Lamb after 118 appearances and 6 goals. He made his debut on Sept 18, 2004 and the most memorable of his half dozen strikes will undoubtedly be the two FA Cup goals - the penalty rebound at Bournemouth and the best goal of the game against Norwich City last season - live on Match of the Day. 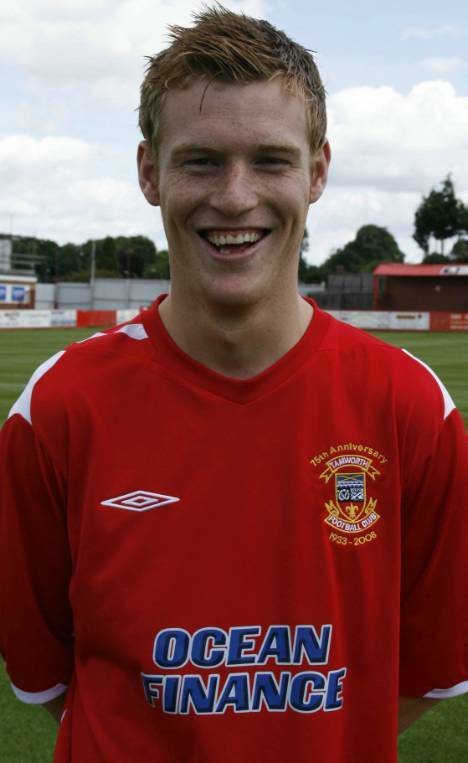 Tamworth FC would like to wish Kyle all the best and thank him for his service to the club over the past 3 seasons. Also departing The Lamb is Mario Pedro who has signed for Hednesford Town after a handful of appearances this season. Expect more transfer activity over the coming week as Gary moves to strengthen his squad even more. At 1pm in the clubhouse on Saturday you will be able to meet midfielder Gary Mills (the player) and defender Dominic Langdon who will be interviewed live on stage and also answer questions from the floor. It is also expected that the majority of the first team squad and management will be in the clubhouse bar shortly after the final whistle so why not stick around and dissect the afternoon's action with them as the results come in.